Senator Gillibrand is pushing to allow all Supplemental Nutrition Assistance Program (SNAP) benefits at farmers markets by equipping them with EBT terminals to process SNAP payments. New York is home to roughly 520 farmers markets, second only to California. More than 2.5 million New Yorkers received SNAP benefits in 2010. As the Farm Bill moves through the Senate Agriculture Committee as early as this week, then on to full Senate consideration, U.S. Senator Kirsten Gillibrand held a teleconference today in which she outlined her priorities for the legislation to strengthen New York State’s agriculture industry and rural communities. Gillibrand, New York’s first member of the Senate Agriculture Committee in nearly four decades, put together a letter, signed by 32 other senators, to cut crop insurance subsidies and hold off any food stamp cuts. The Senator says she is fighting to include measures in the new $500 billion dollar farm law that will expand access to credit for farmers through the Agriculture Credit Expansion Act, and strengthen entire rural economies through the Broadband Connections for Rural Opportunities Act, legislation that connects more rural communities to the global economy with stronger internet access. Gillibrand concedes the bill has not significantly changed from last year's version: it would slash $4.1 billion in food stamps funding over the next decade. If the Farm Bill fails, there is no cut to SNAP. However, Gillibrand says that is NOT the outcome she is hoping for. The Senate panel has scheduled a bill-drafting session for May 14th. The Republican-run House of Representatives is expected to begin writing its version on May 15th. Like all small businesses, New York farms struggle to get the financing they need to stay afloat, grow or expand. Senator Gillibrand is pushing for proposals that expand access to credit for farmers through the Agriculture Credit Expansion Act, and strengthen entire rural economies through the Broadband Connections for Rural Opportunities Act, legislation that connects more rural communities to the global economy with stronger Internet access. Additionally, Senator Gillibrand is pushing to reauthorize the Rural Economic Area Partnership (REAP) Zone initiative, which gives priority access to federal funding through the USDA to support economic development projects and job creation in struggling rural communities, including three existing REAP Zones located in New York – Sullivan County, the Town of Wawarsing and Tioga County. 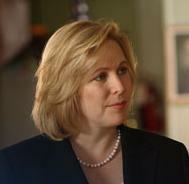 Senator Gillibrand has also advocated for expanding access for more of New York’s rural communities to critical federal funding by raising the population limit for eligibility and giving USDA greater authority to make common sense determinations as to which communities are rural in character and eligible for funding through USDA programs that support community facilities, water and wastewater infrastructure, rural businesses and rural broadband. All of these legislative proposals, authored by Senator Gillibrand, were included in the Senate proposed Farm Bill (S.10). Specialty Crops generate nearly $1.4 billion for New York’s economy each year, making up one-third of New York’s agriculture industry. New York ranks in the top three nationally for production and value of apples, cabbage and grapes. Senator Gillibrand is pushing her Specialty Crop Insurance Improvement Act to strengthen insurance protections for fruit and vegetable farmers, such as those that suffered greatly from Hurricane Irene and Tropical Storm Lee, along with the Shellfish Marketing Fairness Act to make farmed shellfish producers eligible for the Specialty Crop Block Grant program. The Specialty Crop Insurance Improvement Act, authored by Senator Gillibrand, was included in the Senate proposed Farm Bill (S.10). And to help cut through the bureaucracy that can hold New York’s specialty crop products from reaching the market, Senator Gillibrand is pushing for the Apple Red Tape Elimination Act, legislation that would eliminate duplicative inspection fees for apple farmers. As part of a broad effort to promote more locally-grown products and bring it within reach to consumers, Senator Gillibrand is pushing to pass the Local Farms, Food, and Jobs Act to help New York farmers by addressing production, aggregation, marketing and distribution needs while helping consumers access and afford fresh, nutritious food. Senator Gillibrand is also working to promote Community Supported Agriculture (CSA) through the Community Supported Agriculture Promotion Act, legislation that would establish a competitive grant program to award federal funds to non-profit organizations, extension services, and state and local government agencies to provide grower support – ranging from marketing and business assistance to crop development – to new or current CSA farmers, as well as assist in the development of innovative delivery and distribution programs. 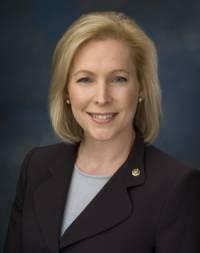 This legislation, authored by Senator Gillibrand, was included in the Senate proposed Farm Bill (S.10). To help connect farm-fresh food to communities that are the most cut off, Senator Gillibrand is fighting for the Healthy Food Financing Initiative to help bring more grocery stores, farmers markets, food cooperatives and other options within reach by providing one time start-up grants and affordable loan financing. This legislation, authored by Senator Gillibrand, was included in the Senate proposed Farm Bill (S.10). Another step in this effort, Senator Gillibrand is pushing to allow all Supplemental Nutrition Assistance Program (SNAP) benefits at farmers markets by equipping them with EBT terminals to process SNAP payments. New York is home to roughly 520 farmers markets, second only to California. More than 2.5 million New Yorkers received SNAP benefits in 2010. Connecting SNAP recipients with farmers markets can help these individuals lead healthier lives with better access to fresh produce, and help support this business for our state’s farmers. Senator Gillibrand will continue to fight for the bipartisan Gillibrand-Collins Dairy Pricing Reform Act to reform the way the USDA sets dairy prices. This bill forces the USDA to begin the hearing process to restructure the pricing system and direct the Secretary of Agriculture to release the Department’s recommendations to Congress. This bill builds on language Senator Gillibrand secured in the Senate Farm Bill (S. 10) that requires the USDA to study different methods of determining prices, including competitive pay pricing or shifting from a 4 class system to a 2 class classification of milk. Senator Gillibrand introduced and is leading the effort to pass the Dairy Income Fairness Act, legislation that would give farms with 200 cows or less a guaranteed $6.50 margin – the cost of milk minus the cost of feed – and exempts the first 200 cows from supply management. The bill would also extend the current Milk Income Loss Contract (MILC) program for nine months, pegged to inflation, while the USDA establishes a new and more sustainable program for dairy farmers. Additionally, Senator Gillibrand will continue to push for a measure to strengthen cold storage inventory reporting, and give the USDA the authority to audit warehouse inventories to help bring more stability to dairy trading prices. Senator Gillibrand is also pushing to have her legislation requiring USDA to announce block voting by cooperatives online, so that all farmers may cast individual ballots if they so choose. These pieces of dairy legislation promoting accurate pricing and farmer participation were included in the Senate proposed Farm Bill (S.10). Senator Charles Schumer is sharpening his warning that if Congress, and the House in particular, does not pass the Farm Bill, consumers may see the price of milk double and dairy farmers lose any price stability. As the Farm Bill moves through the Senate Agriculture Committee and eventually on to the full Senate, New York U.S. Senator Kirsten Gillibrand leads one-third of the Senate in calling for the protection of critical food assistance, urging her colleagues not to balance the budget deficit by cutting food stamps. The Farm Bill under consideration would slash $4.1 billion in food stamps funding over the next decade. Government statistics show that half of food stamp beneficiaries are children. In the next few weeks, the U.S. Senate will once again consider the Farm Bill. New York Senator Kirsten Gillibrand is presenting measures she claims will help stabilize the state’s dairy industry. New York State Senator Patty Ritchie - "Grown in New York"
Several New York state Senators gathered this morning at the capitol in Albany to introduce a package of legislation they say would strengthen the state’s agricultural industry. WAMC’s Patrick Donges spoke with Senator Patty Ritchie, Republican of the 48th district and chair of the Senate Agriculture Committee about the "Grown in New York" plan.